After a long time browsing Carl Arendt's magic micro train layout site, www.carendt.com, I wanted to build a tiny layout. This means very tight radius tracks, 150mm in my case. 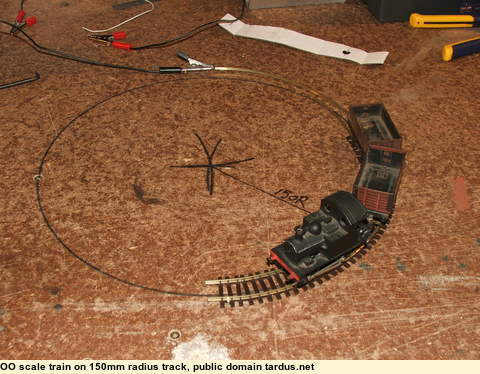 You can't get this in ready-made track sections from Hornby, etc., but you can get flexible track, such as Peco's "Flexitrack", and it is quite cheap (about $5.00 AUS for a 900mm length, HO/OO, code 100). However, bending it to such a tight radius is not easy; you risk kinking the track, or getting a twist along the length of the rails. On Carl's site I read of a simple rail bender, the "Roy C. Link" bender. 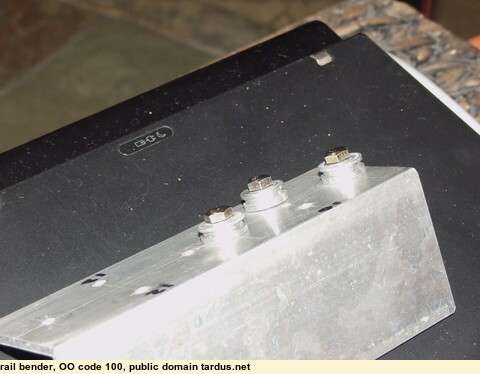 Just a piece of flat aluminium bar with three rollers. This is no longer available as far as I know, but I found a picture of it by googling for it. 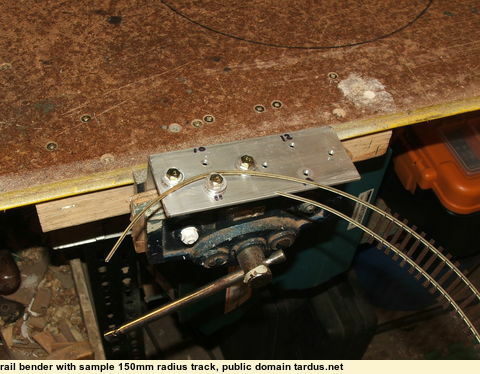 The image comes from RMweb.uk forum, in the entry about the model layout Claverton Engineering. Since I can't buy the rail bender, and since I have a mini-lathe (Sieg C2) sitting begging me to use it (I have been procrastinating! ), I made my own, based on what I could see of the Roy C. Link design. I made the rollers from a piece of 20mm diameter aluminium round bar. You can see the dimensions in this sketch. The 1.3mm wide section is the part that the web of the rail presses against. The groove is to provide clearance for the rail's bottom flange, so that the bending force is exerted only on the web between the flange and the top of the rail. This stops the rail from twisting while it is being bent. Here is a picture of a rail that has been curved to a 150mm radius. I had already slid it back into the Peco plastic sleeper matrix before I thought of taking a photo. I had to pre-bend the first 30mm or so of the rail to get it to engage the rollers. After that it was very easy to push the rail through the rollers and achieve an even curve. 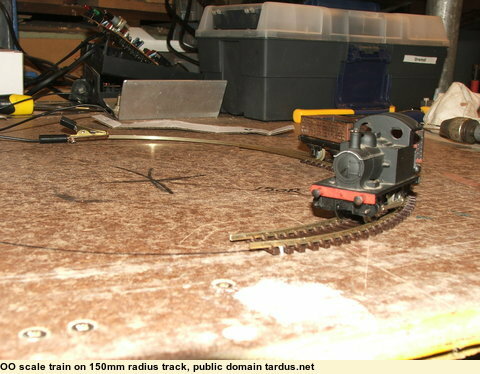 My little black Hornby 0-4-0 locomotive handled the tight 150mm radius curve easily, running slowly on 6 volts power. 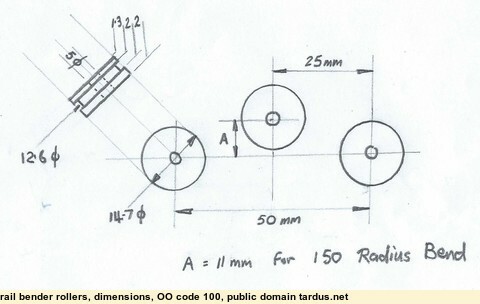 The two old Trix TTR short coal wagons needed their wheel track (distance between the inside faces of wheels) reduced from about 14.1mm to 13.6 mm before they ran freely in the tight curve. My green Hornby 0-4-0 also handled the curve well. An old Lima/Hornby power bogie destined to become a Gn15 scale narrow gauge loco, handled the curve well, slowly and smoothly.